I am one of the many people who have never given up on the search for who killed John Kennedy. It is one of my favorite "parlor games." In a way I hope it is never solved as it would deprive me of a lifelong hobby. I was 9 years old when Kennedy was killed in Dallas. It was a major event in my young life. Who is D. Harold Byrd? And what is his connection to the Book Depository? In May 1963 when the planning for the President's Dallas trip began, Mr. Byrd purchased the Sexton Building and renamed it the Texas School Book Depository. Sounds like the school system owned it. But in fact it was a private company owned by Mr. Byrd, who was, as I have already stated, an oilman who was no fan of the president. With the Kennedy administration hammering away at the Oil Depletion Allowance; which is still in effect today; Mr. Byrd stood to lose millions of dollars if the allowance were terminated. The Sexton Building sat on one of the routes necessary for the President to reach his destination at the Trade Mart. The other route was around the corner, and changed at the last minute. The Convention Center had already been booked for November 22nd by Pepsi-Cola for their annual meeting, during which they would be discussing the shortage of sugar due to Castro's continued hold on Cuba, which they blamed on Kennedy's policies concerning the island, and the increase in the price of sugar which was cutting deeply into their bottom line. Mr. Byrd was also the founder of the Civil Air Patrol- the group that links Oswald and David Ferrie to JFK's murder. Mr. Byrd was a former employer and partner with George DeMorschildt, the man who, along with his wife; and later with Ruth Paine; befriended Oswald in Dallas in the days leading up to the assassination. And, both were connected to George H.W. Bush, President of Zappata Offshore Oil. Zappata is the entity that "donated" the million dollars demanded by the Watergate Burglars to ensure their silence in the wake of the Watergate Burglary, which toppled the Presidency of Richard Nixon. 6 weeks prior to the assassination of JFK, and only a few weeks after Mr. Byrd had the building opened for operation, Lee Harvey Oswald was steered to the job there by Mrs. Ruth Paine, who was an acquaintance of Mr. Byrd's. Coincidence? Probably not. The chances of ever really knowing the truth are probably slim to none. But the story of Mr. Byrd, and his purchase of the window from the building he owned at the time of the murder of JFK, smacks of a man who wanted a trophy of sorts from one of the most shocking deeds of the 20th century. At any rate, it's food for thought. 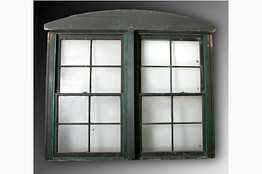 Here's an article from the Wall Street Journal in 2009 about this window; and another one; which was also removed from the Book Depository. It seems that there is some speculation about which window is the real window. The article makes interesting reading, as it underscores just how much of an impact JFK's assassination had at the time, and the fascination which it still holds today, 50 years after that day in Dallas.